Whilst studying botany at the University of Toliara in southwest Madagascar, I was always hearing about Blue Ventures (BV) from my peers – either because of the Samba Getty scholarship or because they were from the village of Andavadoaka where BV was born. I have a passion to preserve the environment, and wish to develop my English skills, so BV sounded like the perfect organisation for me. Fresh from my graduation, I was overjoyed to see an advertisement for a blue forests technician with BV, a great opportunity to join their team! I was nervous however, as I thought my lack of professional experience might count against me – a problem for thousands of unemployed young people in Madagascar… but life is full of surprises, and my application was accepted! After my recruitment I learnt all about BV’s projects in the Velondriake Locally Managed Marine Area in southwest Madagascar, and in particular about Tahiry Honko – the country’s first mangrove carbon project with locally-led mangrove management. The Tahiry Honko project is designed to earn carbon credits through the conservation and restoration of over 1,200 hectares of mangrove surrounding the Bay of Assassins in southwest Madagascar, and aims to sequester around 14,000 tons of CO2 per year. The sale of these carbon credits will benefit ten villages in the region – approximately 4,000 residents in 895 households. Community-led alternative livelihood initiatives are a large part of the Tahiry Honko mangrove management strategy, as they reduce community dependence on mangrove wood and fisheries. Sea cucumber and seaweed farming have already been successfully set up, so my first task was to provide support for a new alternative livelihood initiative – beekeeping! The three villages of Befandefa, Ankindranoke and Andalambezo in the Bay of Assassins were chosen for this initiative, as they are further inland and have more need for alternative livelihoods. From the very beginning of my time with BV I have been working closely with these three communities, leading a series of meetings to inform everyone about beekeeping and to identify any interested people. 30 people across the three villages said that they were interested in becoming beekeepers, so I arranged for CITE Madagascar to lead training sessions in each village. These sessions covered bee behaviour and the different methods of beekeeping, including how to construct modern hives, capture colonies, extract honey and identify the potential enemies of your bees. By the end of these sessions everyone was comfortable with the theory, so it was time to try it out for real! 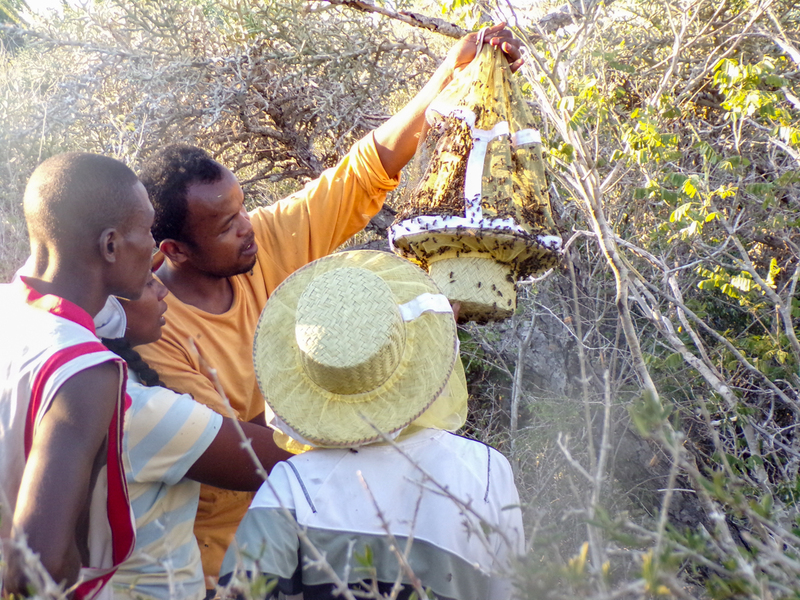 I was nervous at the prospect of capturing our first swarm, but some of the trainees from Ankindranoke had previous experience in traditional beekeeping and this gave me more confidence. Late one morning, a man in Befandefa told us that he’d seen a colony of bees about 2 km to the west of the village, so we packed our smoke blowers, hives and beekeeping hats, and started hiking into the spiny forest. We’d learnt in the training sessions that bee colonies are often found in the branches or trunks of trees or within holes in rocks, and it wasn’t long before we found them in a rocky crevice. Confronted by the loud buzzing and the fear of getting stung, some of the trainees refused to go near the swarm, but others approached with me to watch the capture process. I will not deny that I was nervous also, but I strove to combat my fear and take action by following the instructions we’d received during our training. The whole process took almost two hours, and there were a couple of stings along the way, but we all agreed afterwards that the bees were much friendlier than we expected!After putting on our beekeeping hats we used smokeblowers to try and make the bees more docile, but they still scattered when we touched them. Bees were flying all around us, and covering our bodies, but we knew that we had to remain calm. We managed to identify the queen bee and capture it in one of our hives, and after that it was much easier to capture the rest. The whole process took almost two hours, and there were a couple of stings along the way, but we all agreed afterwards that the bees were much friendlier than we expected! After this successful first capture, we managed to capture more bee colonies over the next few weeks. With each new success the confidence of the trainee beekeepers increased and their skills progressed. To tackle that challenge, one representative from each village participated in a learning exchange to Ambanja in northwest Madagascar, where Blue Ventures has been supporting beekeeping activities since 2016. There are currently 38 beekeepers in the Ambanja area, who have produced over 170 kg of honey and sold it at 5,000 Ar/kg. The three representatives and I spent four days with a technician from HELVETAS – an NGO with expertise in community-led beekeeping – learning technical skills and visiting community hives. We learnt that retaining captured colonies is easier during the flowering season, when more food is available for the bees. Another key technique is to trap the queen within the hive, as the other bees will not leave without her. We also learnt that environmental conditions such as availability of water, trees and flowers play important roles in beekeeping success. Northwest Madagascar is home to humid and dense forests, making it a practical location for beekeeping, but the southwest has an arid climate with fewer flowering trees. Despite this, beekeeping is still an alternative livelihood worth pursuing, as the environment is not suitable for agriculture. After the exchange visit, the beekeepers in the three villages decided to create better environmental conditions around their hives by building botanical gardens of trees and flowers, and building wells to ensure that water is available for the bees. The next step is to wait for the flowering season before capturing new colonies for the hives that were abandoned. Despite the challenges that the beekeepers have faced, they’re still showing admirable motivation and determination. The exchange visit to Ambanja instilled a fresh belief in them, and pushed them not only to keep pursuing their beekeeping but also to preserve other parts of their local environment and plant more trees. I have great hope for the future of this project in Velondriake. I have a bee colony in the US in Oregon which is in the Pacific North West Region. I have planted drought tolerant flower and shrubs in my yard to help support them. I still have to water the shrubs and flowers but since they are close to a water source it is easy. The Bees love them. I have planted shrubs and flowers that bloom at different times. They start blooming in spring and others bloom until mid summer. I don’t know if this is possible where you are but it really helps keep the bees happy. I’m a bird watcher too and when they go to seed, I get a huge variety of birds. So if you are interested in harvesting seed from bee attractant flowers and shrubs, you will need to capture the seeds before the birds. Over what period of time was this 170/kg of honey produced? That works out to 850,000Ar which divided by 38 beekeepers works out to $6.38/beekeeper. Hi Timothy, thanks for your question. At the time of writing, these were the most up to date stats available to Christelle, but you’re right that they don’t tell the full story. There has been a gradual increase in beekeepers since 2016 and five honey extractions since January 2017. At the latest extraction in December last year in the Ambalahonko commune, 236kg of honey were produced by 17 beekeepers and sold at 9,000Ar/Kg, and there is a three-year business plan to upscale production and increase price/kilo. In the Ambanja district, community-led apiculture is still in a developmental stage, but is showing potential as a supplementary income for communities living in extreme poverty.